The first volume of this series ended with a cliffhanger, which is resolved here in dramatic and exciting fashion. The formerly overmatched Adrian finds the strength and ability to hold his own in the competition, and the motley duo finds themselves a measure of fame from their tournament exploits. I don't want to give too much away, but a lot happens in this book: success gives us some insight into these characters, a flirtation blossoms into some romantic episodes, and we learn a lot more about Richard Saldana and what a jerk he might actually be. 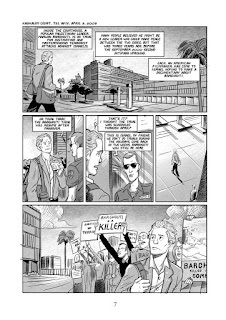 As you can see from the excerpt above, the action sequences are great, giving a clear sequence of events and also building up suspense and mystery. This artwork is emblematic of the story in this book as well. The plot is breath-takingly fast, with multiple revelations, mysteries uncovered, and other mysteries created. 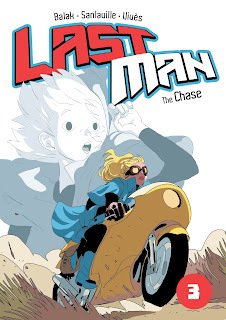 I don't know exactly where this series is going, but I am definitely along for the ride. Like I noted in my review of book one, the three creators behind this book all come from different field: Balak is a noted animator who also does some digital comics work. Michaël Sanlaville is a video game designer, and Bastien Vivès is an award winning comics artist. All three creators speak more about this volume and where this series might be going in this series of interviews. I have not seen many reviews of this book of yet, but the ones I have read are very positive. I find so much to agree with in Seth T. Hahne's take on the book, that it follows "in one of my favourite manga traditions by decimating what I had imagined was status quo. By the end of the volume, we realize that the last two volumes are mere prologue for what should prove to be a much larger, more satisfying story. And I am blisteringly excited to watch it unfold." Caro called the artwork "opulence given form." 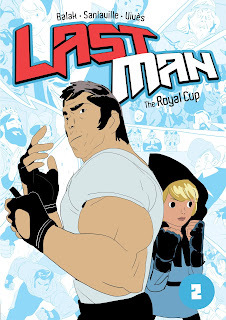 The Royal Cup was published in the US by First Second, and they have a preview and much more here. Because there are more sexual situations in this book than the first, I would recommend it for older adolescents or readers mature enough to handle them. Last Man: The Blog Tour! 1. I have read a little bit about how you plot out the book in a pretty informal way, but what comes first, the visuals or the words for the story? Does it change depending on the situation? Haha, sounds like you're interviewing Bob Dylan or Nicky Minaj. "What comes first, the lyrics or the melody?" It's kind of a strange mix. We have the story landmarks settled, the big twists and where the characters have to be, but in between we let ourselves go: it can drawn by the will to suggest a particular scene, an emotion, a feeling, or the inspiration to draw a certain landscape... We pitch the idea or the scene at each other, like if we're telling ourselves stories by the campfire, trying to reach that "this is cool/scary/funny" reaction in the two guys in front of us. This is the cool thing when you've got three authors on this. When you're on point, you knows this right away, it's a collective gut reaction. 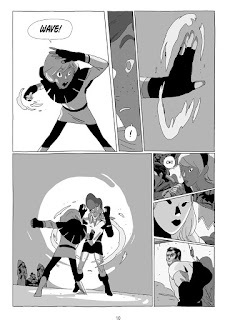 And then we just go with a loose description: Balak is shaping the scene and dialogue at the same time he is making the storyboard. 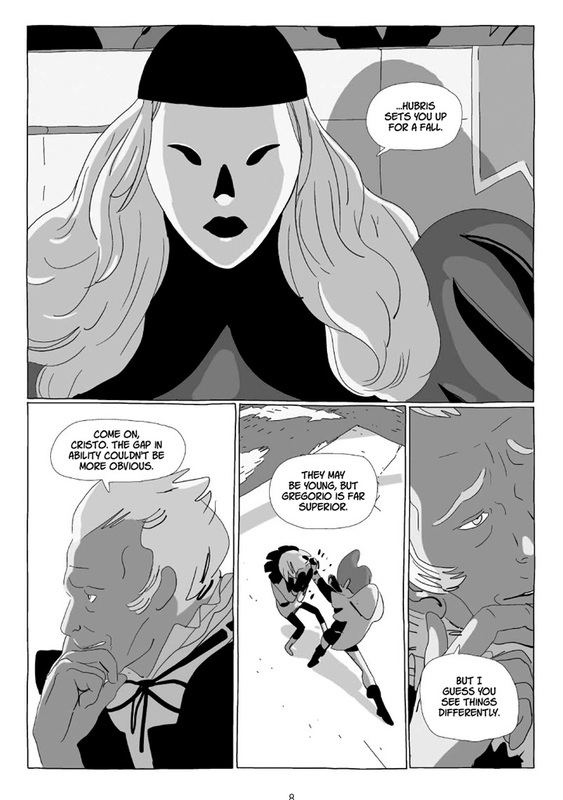 The drawing, and actually the storytelling, how panels are flowing, calls for the writing, in the end. And when we have the final drawings, we go back to shape the dialogue some more. That's NOT how this is supposed to be, but that's how we do it, it keeps things fresh and exciting to us, and hopefully the reader. 2. Are we going to learn more about Mr. Jansen? The guy is a mess! Jansen is a good example of what we just talked about. In the very beginning, he was meant to be just “Adrian's teacher.” But then, when the scene was developed and drawn, he took a life on his own. 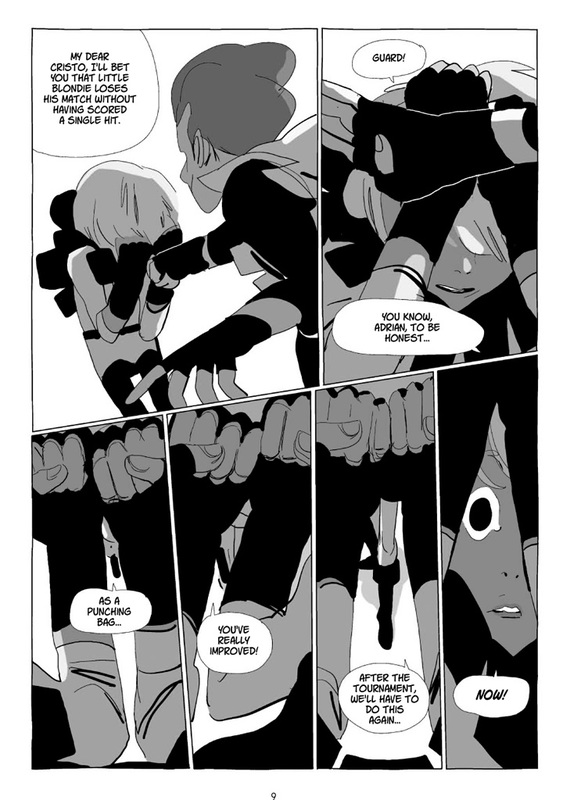 Bastien decided: "let's make him madly in love with Marianne." He’s a big loser, the absolute counterpoint of Richard Aldana. And then he became much more than this in later books. It's like when they initially wrote Spike in Buffy the Vampire Slayer. He was not supposed to be that big of a character, but when they saw James Masters on screen, they decided to give him more screen time, to eventually become everyone's favorite. In the end, the short answer is yes, you will learn more about Jansen. We love that character! 3. Why does Richard Aldana seem smart about some things and clueless about others? Such as, why does he not remember the rules of the Games? Richard is not lying when he is saying is not from the neighborhood. He's not from king valley, but he know about king's valley... all this will be revealed in later books as well as in the TV animated series we're currently doing. 4. After seeing the video game preview, I wonder will we see more tournament fights later in the series where the opponents are not all magic users? The video game is a bit special, he is tied to Richard's past. We will see in book four a video game, and this is that video game you can play. Can't say too much without spoiling anything! 5. What American comics are popular in France, if any? You have lots of super heroes magazines translated in French, DC and Marvel, in every press shop. But the latest huge success is the Walking Dead comic books, it's a best-seller here. French are big fans of Bill Watterson’s Calvin and Hobbes, too, it's bigger than Peanuts here. You are very fortunate to live in France when you love comics, bande dessinée and manga. We have a lot of comic shops, selling comics from all around the world. That's not the case in all the other European countries. And thus concludes our interview. Thank you so much, Gina, for setting this up, and also to the creators for their wonderful responses! You can follow the blog tour by visiting this link. My review of volume 2 will be out soon. The next installment in this exciting series comes out in October! Goliath is a sparse, poignant, and inventive retelling of an old, familiar tale. 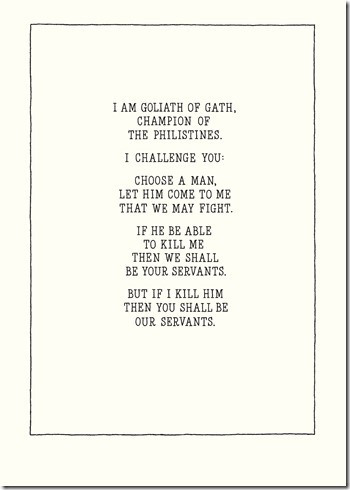 It re-imagines the Philistine giant as an introspective and philosophical man who is more prone to doing administrative tasks than being a warrior. However, being that he stood at six cubits and a span tall (9.5 feet! ), he becomes part of a plan to deter any Israelite attack. Twice a day for 40 days he goes out decked in armor to challenge the forces of Israel, putting fear into them because of his massive size. Not much of a warrior, he is more a tool of his leaders. He spends much of his day in the company of a 9-year-old shield bearer, and mostly he stares at the wastes in the valley and the rocks that cloak the enemy camp. Eventually, he does not even go back to camp with his troops and chooses to stay out in the valley, perhaps even contemplating deserting his post. This is a darkly funny book, with his quotidian routine making him quite relatable. And when the inevitable ending occurs, it does not seem very celebratory. 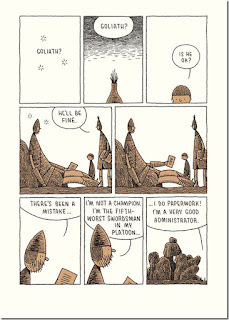 The creator responsible for this clever, moving book is Tom Gauld, a Scottish cartoonist who draws a weekly comic for The Guardian. His collection You're All Just Jealous of My Jetpack was one of my favorite books of 2013, and his spare artwork bursts with meaning and feeling. He speaks more about his work, both on this book and in general, in this interview. 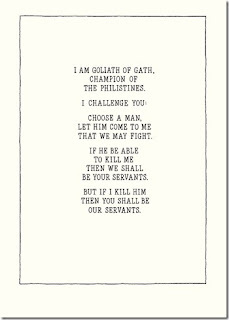 Goliath has received much praise and was nominated for an Eisner Award. Marty Mulrooney concisely concluded, "Goliath tells a familiar story from a fresh angle and the results prove delightful." 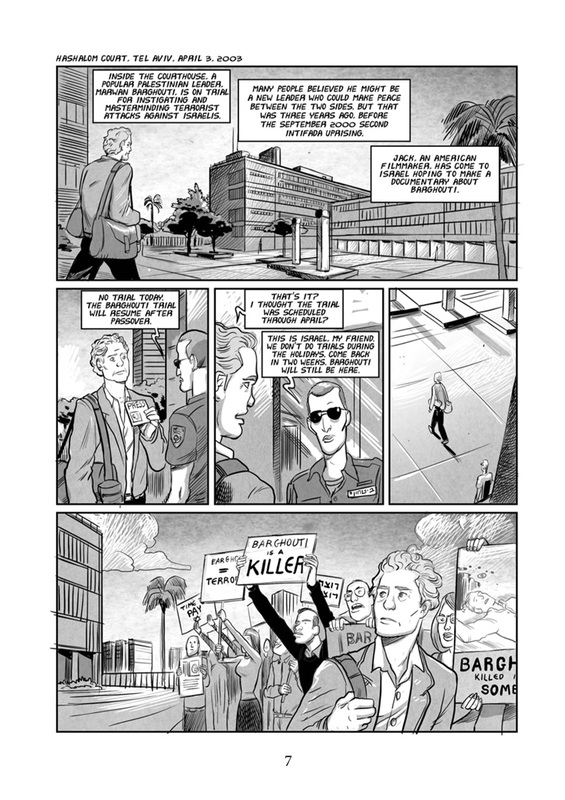 Noel Murray praised the book "both for the alternately funny and poignant scenes of its hero waiting forlornly on the plain for something to happen, and for Gauld’s art, which is typically on-point." Jeff Jackson wrote that it is "an example of what good storytelling can do, even with stories we’ve heard hundreds of times." 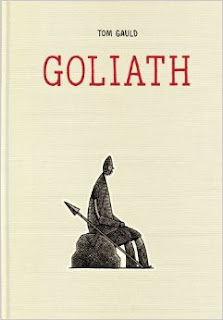 Goliath was published by Drawn & Quarterly, and they have previews and much more information about the book here. Oregon Trail: The Road to Destiny is the account of 11 year-old Rebecca Weston's family's trek across the USA from Baltimore to Oregon in 1848. It is chock full of historical details, family drama, sadness, triumph, trials, and tribulations. At the beginning when the family prepares for the journey, it feels much like the classic video game about the same topic, but as matters progress I felt more and more connected to this family and their experiences. I love the simply realistic artwork, here in black and white. It very much captures the grit and texture of life in the 19th century with its cross hatching. Traveling by wagon train was no easy thing, and the rigor and hardship, both physical and mental, is well portrayed. 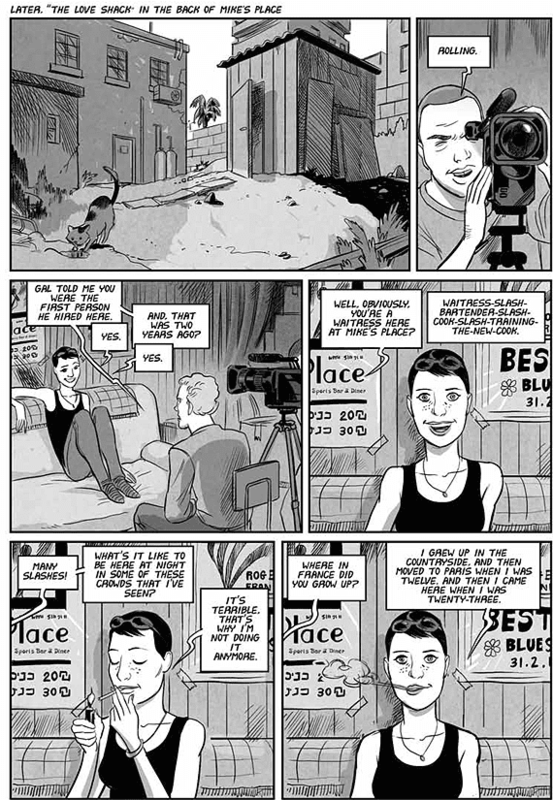 The artwork also is great at relaying the characters' emotions and capturing the various vistas and cityscapes the Weston family find themselves in. I feel it would be an excellent addition to any classroom library and well suited for use in upper elementary or middle school classrooms. This book's authors, writer Frank Young and artist David Lasky, also collaborated on The Carter Family: Don't Forget This Song. 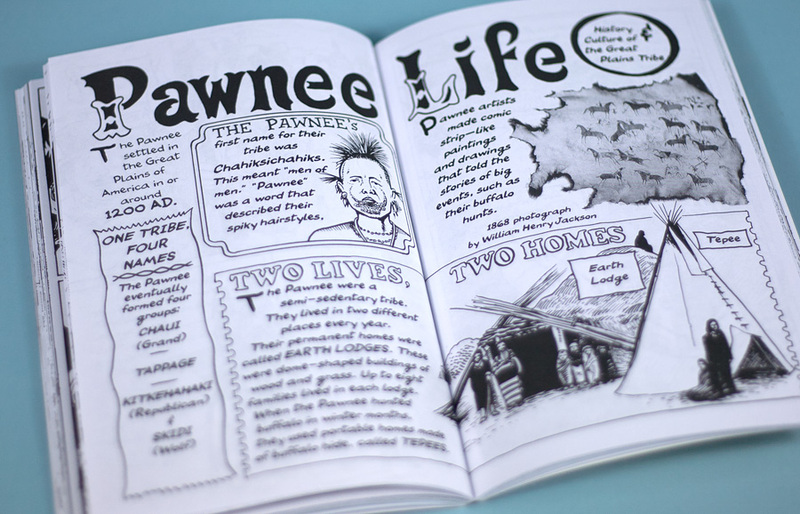 The book's creators also have a blog that shows pictures in process, lots of photo references for the book's images, various school signings, and other interesting goings-on related to this book. I could not find many reviews for this book, which is unfortunate given how well done it is, but the two I found were very positive. Teddy Rose wrote, "I didn't pay that much attention to history in school. I found the old text books dull and boring.This book is very engaging." Corey Blake commented that Young and Lasky "tell an engaging story" and that the book is "targeted to preteens but it’s smart enough for older readers." 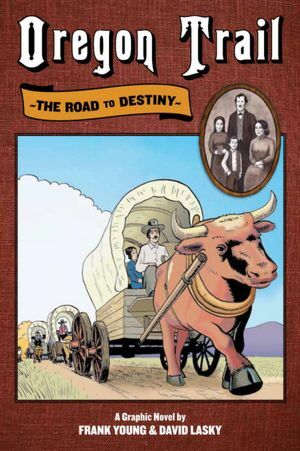 Oregon Trail: Road to Destiny was published by Sasquatch Books and they have more info here. There is a preview available at Amazon. 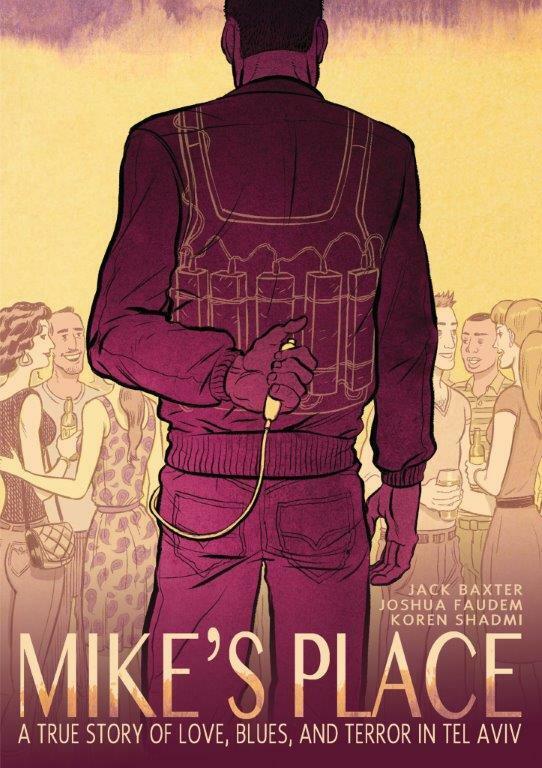 Mike's Place is a gripping, heartfelt true story about a blues bar in Tel Aviv that was attacked by a suicide bomber in 2003. 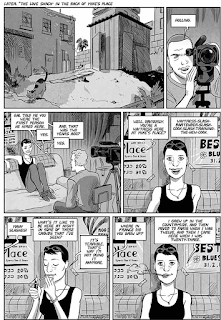 The events were also depicted in the 2004 documentary Blues by the Beach, and two of the filmmakers wrote this graphic novel. The documentary was in the works already, an attempt to capture the spirit of Mike's Place and why it was a place of joy amidst much turmoil. It turns out that terrorists targeted this establishment because it was such a center of joy and relief, and their true life narrative turned tragic. What is impressive about this book to me is how much it tackles. It gives a human face to the "Mike's Place family," the people who worked and played at the bar, some who lost their lives and all who were victims of the violence. Getting to know these folks endeared them to me and gives the final events more impact while putting a human face on these events. The book also has the intrigue of a thriller with glimpses into how the bombing was planned and carried out. It clearly depicts the social and political circumstances in Israel at the time that bring about this horrible act as well as its resulting grief and aftermath. Finally, this book is a critique of the use of violence by religious extremists, a point driven home by the use of quotations from the Qur'an that open each chapter of the book. This graphic novel was written by Jack Baxter and Joshua Faudem, who are also characters in the story, and drawn by Koren Shadmi. Baxter was a producer of the 2004 documentary film and Faudem the director. 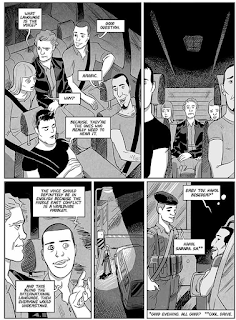 Baxter speaks about the creation of this graphic novel in this interview. 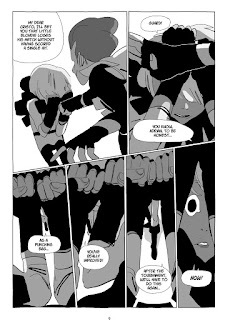 Shadmi is an artist who has worked on a webcomic The Abaddon as well as published a collection of short comics stories called In the Flesh. Here, his artwork leans toward realism, and he does very well in conveying emotions, personalities, and actions via journalistic black and white images. All of the reviews I have read about this book describe a book that is powerful and moving. Brett called it "beautifully haunting." Bradley Campbell called it "a gripping read" that "shows you that people have the ability to heal; but it also shows how difficult, complicated and saddening the healing process can be." Joe Gordon wrote, "It’s funny, it’s sad, it’s upsetting, it’s inspiring, it has happy moments of laughter and dreadful troughs of despair, just like life, really, but through all of the events here remains that warm, human feeling of inclusion and family, perhaps our only real defence and hope against the hatred in the world." 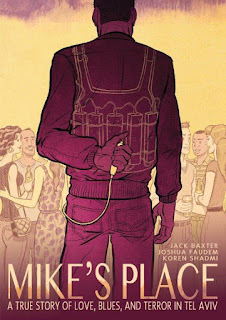 Mike's Place was published by First Second, and they have a preview and more info available here. There is also a video trailer of the book posted here. A review copy was provided by the publisher. Thank you, Gina! 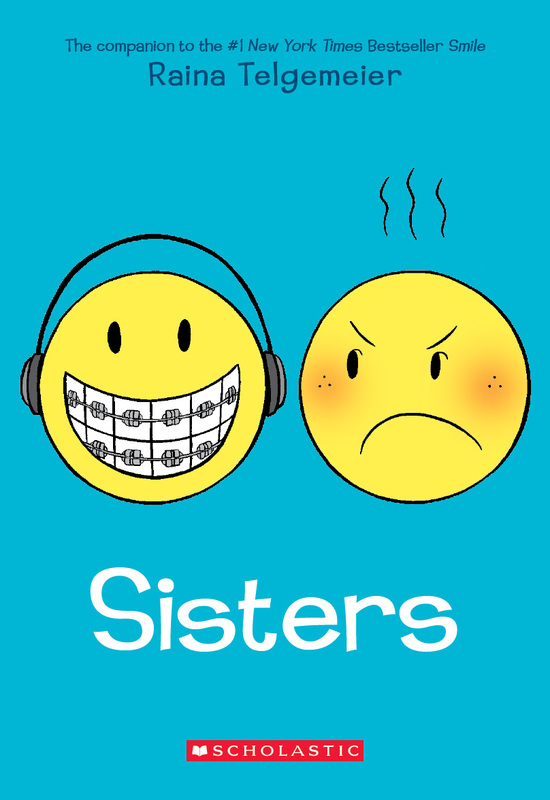 "Be careful what you wish for" is a widespread idiom that plays out in Sisters, a memoir by Raina Telgemeier that is a "companion" to her wildly success Smile. The book details a family road trip that is full of annoyances, wonder, and travails. It also contains lots of flashback scenes marked by the sepia toned backgrounds, like pages from a yellowed book. From those, we see that Raina really, really, really wanted a sister. Well, after she gets one she finds that things are not all that swell. Her little sister Amara likes throwing her toys. They bicker over art supplies and space to draw and play. They have to share a bedroom, which creates more tension, and their personalities just don't seem to mesh all that much. Just take a look at this scene from the road to see what I am talking about. What I really enjoyed about this book is how well it captures a whole bunch of small but very relatable moments. 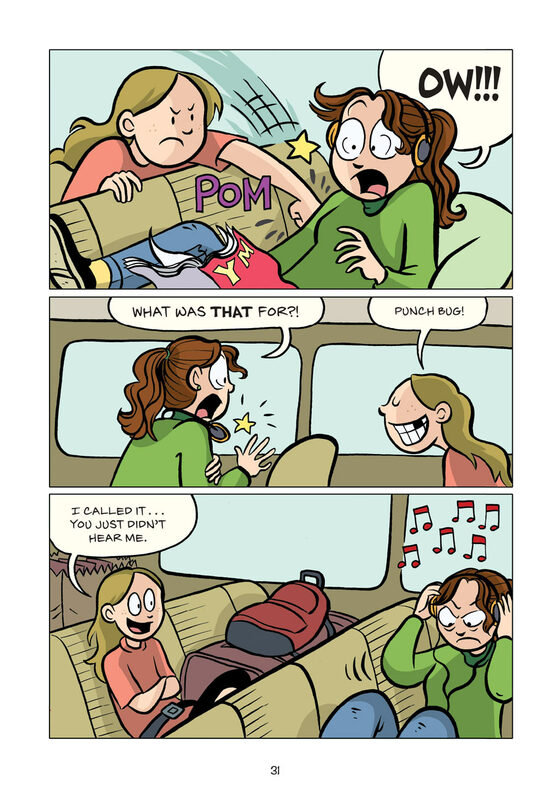 As an older sibling myself, I can remember many similar situations and scuffles with my sisters. Also, the characters are nuanced in ways that they are all realistic and very human, not completely good or bad. I liked that there were many shades of grey. The artwork is clean, well paced, bright, and it conveys much emotion and energy. Sisters is an all around enjoyable and well-made graphic novel. Raina Telgemeier has been nominated for Eisner and Ignatz Awards, and she won an Eisner for Smile. 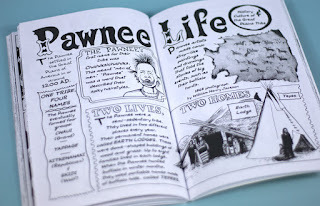 She has also created the YA graphic novel Drama and drawn four adaptations of The Babysitter's Club books, which have garnered accolades from the Young Adult Library Services Association and the American Library Association. 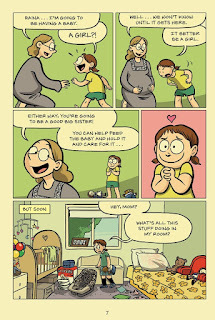 Telgemeier talks about her inspiration behind Sisters in this interview. Or if you would rather read an interview with her about the book, you can go here. All of the reviews I have read about this book have been very positive. Brigid Alverson commented that the author "wraps some larger truths in the minutiae of everyday life, creating a story that many readers will be able to relate to, in its bitter moments as well as its warmer ones." Maya Van Wagenen wrote, "Telgemeier uses her expressive, cartoon-style drawings to bring context and emotion to the minimal text, which is almost entirely dialogue. I love her work, not because it is exotic or unusual, but because she writes stories we have all lived, and tells them in a way that feels uncomfortable yet transcendent." Kirkus Reviews gave it a starred review and summed it up as "A wonderfully charming tale of family and sisters that anyone can bond with." 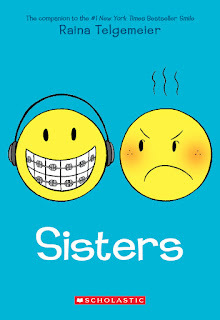 Sisters was published by Scholastic, and they have information about the book here. They have posted a video preview of the book here.